“The Geese Theatre Company’s work with prisoners isn’t just about performance. It’s much deeper than that, and it challenges the participants to look at their lifestyle and make changes,” says Doug Kerr, a project manager at Auckland Region Women’s Corrections Facility. Doug worked in Scottish prisons for 14 years before coming to New Zealand in 2008. He saw The Geese Company working in both men’s and women’s prisons, and describes the impact of their work as “very powerful”. 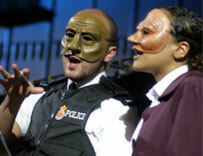 Based in Birmingham, The Geese Theatre Company comprises a team of actors and group workers who present interactive drama and conduct workshops, staff training and consultation within the criminal justice system in the United Kingdom. Since 1987, the company has worked with more than 150,000 offenders and 30,000 other individuals. The company believes that drama is a powerful and effective vehicle for inviting individuals to examine their own behaviour, and is a catalyst for promoting personal development and change. Using both full face and half masks as theatrical tools, it works with the notion that we all wear masks. 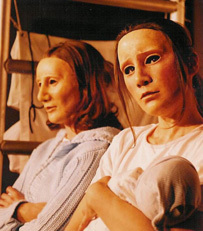 In performances and workshops, audiences are invited to ask characters to “lift their mask”, and can question them about their thoughts and feelings. It’s a technique that explores the distinctions between external behaviour and internal experience. One prisoner, based on his experiences of working with company, has written: "I felt emotionally drained afterwards and I can't stop thinking about it. The masks were excellent - I've worn all of them in my time. I was really impressed by the support everyone gave each other, and I was really affected by the realisation of the amount of damage I've caused." Performances for prisoners are based around “frameworks” that are developed around themes such as types of crime (e.g. drug trafficking, domestic violence), life events (e.g. resettlement, parenting), types of prisoners (e.g. young people, women) and character development (e.g. motivation, responsibility). 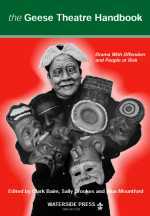 Improvisation and interaction with audiences occur within these frameworks. As characters have to deal with situations that threaten to disrupt their lives, they are open to challenge from the audience to explain their actions. The emphasis gradually shifts so that the characters play out the advice given by the audience. The Geese Theatre Company’s handbook, Drama with Offenders and People at Risk, edited by Clark Baim, Sally Brookes and Alun Mountford, explains the thinking behind the company’s approach. It contains more than 100 exercises with explanations, instructions and suggestions to help practitioners develop their own style and approach. The materials can be readily adapted to different settings including conflict resolution, restorative justice and interpersonal skills training. The handbook can be ordered and purchased online. Original generation time 1.3939 seconds. Cache Loaded in: 0.0004 seconds.